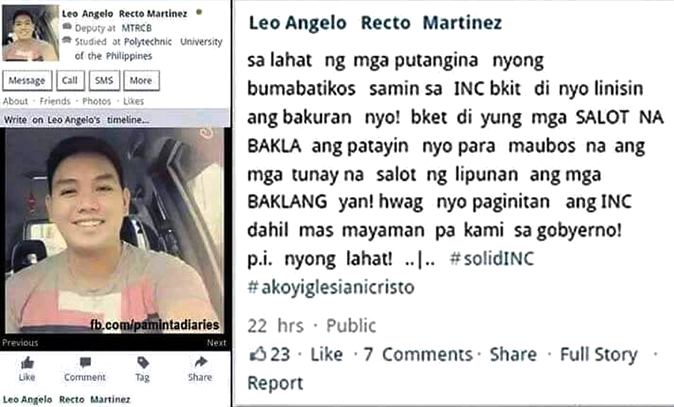 A member of the Iglesia Ni Cristo (INC) has denied posting a Facebook rant that went viral on social media and sparked outrage among gays. In his alleged post, Leo Angelo Recto Martinez cursed the critics of the influential religious group and called gays "salot ng lipunan." He also allegedly bragged that the INC is wealthier than the government. 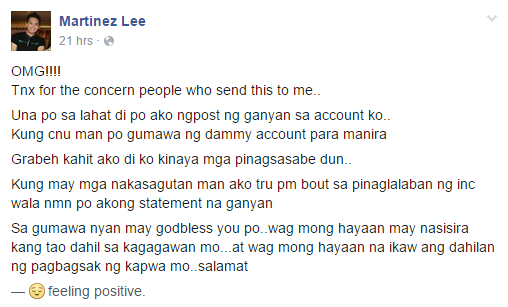 Martinez apparently changed his Facebook handle to Martinez Lee after receiving flak from angry bashers. In a status post on Tuesday, September 1, Martinez thanked those who sent him a screenshot of the derogatory statement but refuted allegations that he was the one who posted it. He claimed that it was published using a "dummy account" to discredit him as an INC member.